Transform your garden into the most extraordinary year-round living space with our custom LED lighting solutions. Discover what high-quality LED decking lighting can do for your exteriors, creating a beautiful outdoor environment for the whole family to enjoy. Throughout the year, LED decking lights can make the most incredible difference to the appeal, aesthetics and functionality of all types of outdoor living spaces. From the simplest white decking LEDs for basic illumination right through to the most vibrant and colourful LED decking lighting systems, we can provide you with a bespoke solution to create the outdoor living space of your dreams. For more information on our custom LED decking light solutions or to discuss your requirements in more detail, get in touch with a member of the Fibre Optic FX customer service team today. Whether looking to illuminate your living space for practical purposes or simply bring a touch of elegant sophistication, you need LED lights for decking you can count on. Given that such devices are exposed to the elements throughout the year, there is no room for compromise when it comes to quality or reliability. 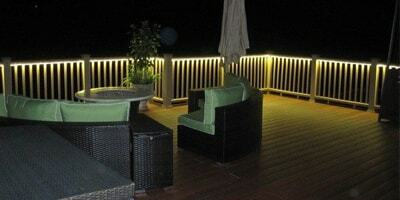 Which is precisely why we offer LED lights for decking that deliver real durability and safety. Regardless of what the elements throw at them, you can count on our decking LED strip lights to go the distance. What's more, we also work hard to provide dynamic custom LED decking light solutions to suit all purposes and pockets across the board. From simple square LED decking lights for basic illumination to colour changing LED decking lights for enhanced visual appeal and all else in between, we've got the products you need and expertise you can count on. We can also offer motion activated and timed LED systems - designed in accordance with the requests of our customers. While the technology behind our LED decking lights may be sophisticated, the LED lighting we offer really couldn't be simpler. Whether looking to assemble your own perfect package from scratch or have us create a bespoke solution on your behalf, you'll find external LED lighting easy and convenient to work with. What's more, high-quality decking LEDs guarantee the kind of long-term lifespan that translates to unbeatable value for money. With an average usable life of approximately 50,000 hours and energy reductions of up to 90% (when compared to traditional bulbs), LEDs are uniquely affordable to own and operate. And for total control, most outdoor LED lighting systems are compatible with innovative controllers, which can be used to activate, deactivate and dim your decking LEDs at the touch of a button. Whether ready to go ahead with your order or still in need of a little inspiration, we'd be delighted to hear from you. Get in touch with a member of the Fibre Optic FX customer service team today for more information, or to discuss your requirements in more detail.